Ada Pradhaman & palada payasam is a common kheer among Keralites esp for Onam Sadya(banquet lunch on a banana leaf) & marriages or any special occasions.Though ada(thick rice flakes) are available in stores for making payasam but this time I wished to try the home made ada.Mom had made these once or twice though not regularly but sure is a keeper.I have shared two methods of making ada,you can use either of them if preparing at home.The first method ada can be stored in air tight bags for days but the second method,the ada has to be used immediately.Both methods the ada is soft,need no further cooking if used immediately for making payasam.The second method is preferred in most marriage catering & functions in Kerala.Though I wished to post it before Onam,but due to the laptop issues got struck.Anyways,better late than never.Do check this out at home or bookmark the post for further reference !! Wash & soak the rice in water for 1-2 hours. Drain the water and grind the rice in a blender until smooth with very little water like idly batter but thicker. (use minimal water).Add pinch of salt and mix. Apply half a spoon of coconut oil on the reverse side of the leaf.And spread the batter on the other side(good).Spread it as thin as possible.Roll the leaf tightly and tie with a string. 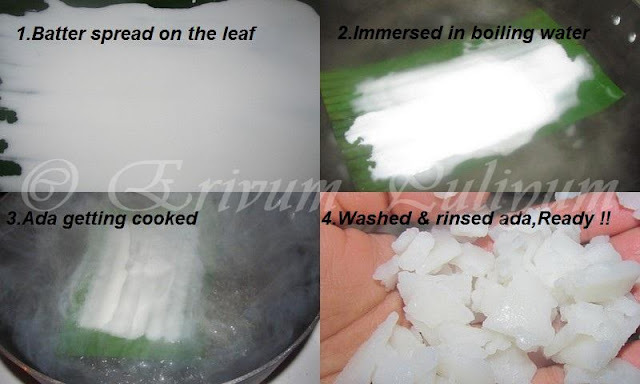 Boil water in a idli cooker or pressure cooker and place the rolled leaf in it. Steam cook for 10 -12 minutes.Remove from cooker,let it cool and you'll find the ada leaves the leaf. 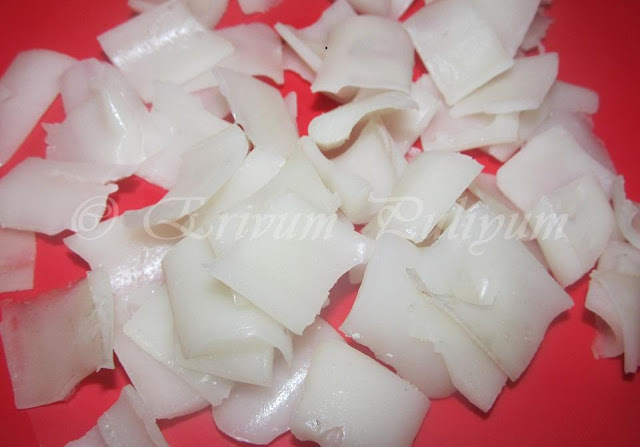 Cut into pieces and prepare your delicious pradhaman or payasam !! The steps 1& 2 remain the same from the above method. Wash and dry the banana leaves.Cut the sizes as per your pan size.Apply oil on top of the leaf. Boil water in a wide bottomed pan to constant boil such that the leaf fits in properly. Spread the batter thin and when the water is boiling hot,drop the batter spread leaf in it. Leave it to cook for 5 minutes,you will notice the color change of batter to that of translucent. Remove from flame.Put the cooked ada in warm water.Rinse the ada in water for 4-5 times until the stickiness of batter and oil leaves from ada. Cut into smaller bits when cooled and then ready to usde for payasam !! *You can use rice flour too for making adas,if so then add salt and water little by little and make it into a spreadable batter.The ground rice batter yields more softer ones than the rice flour ones.Also make sure you are using good quality rice flour with minimal stickiness. * If you are refrigerating ada after preparing,then please put it in hot water before making payasam like the store brought packet.Refrigeration hardens the ada.This is not required if using immediately for preparing payasam. 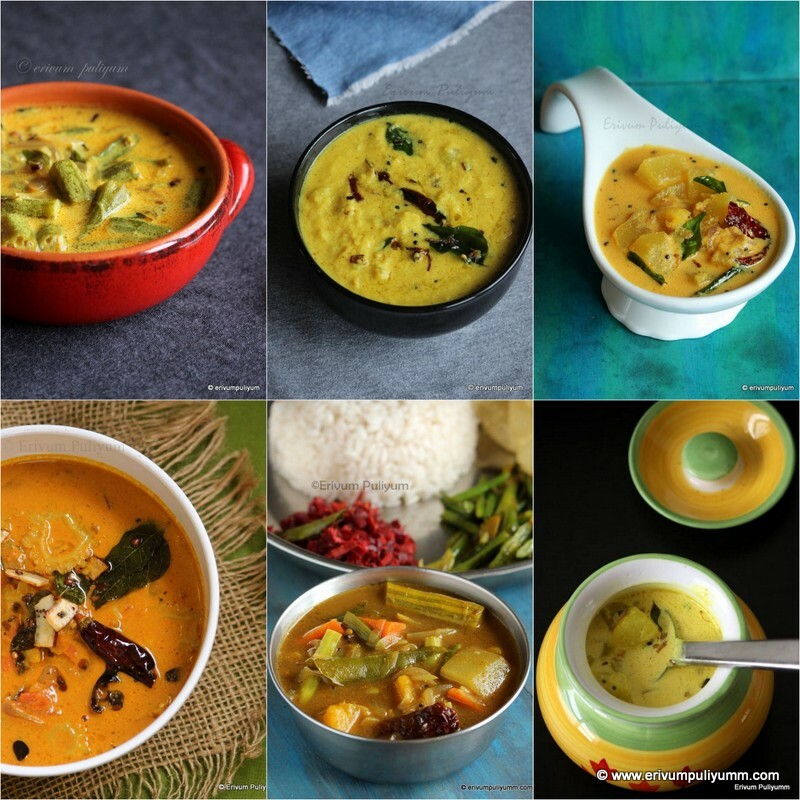 * The second method ada has to be used immediately for making payasam,canot be stored long. * You can cut the ada in bigger or smaller pieces as per your wish. 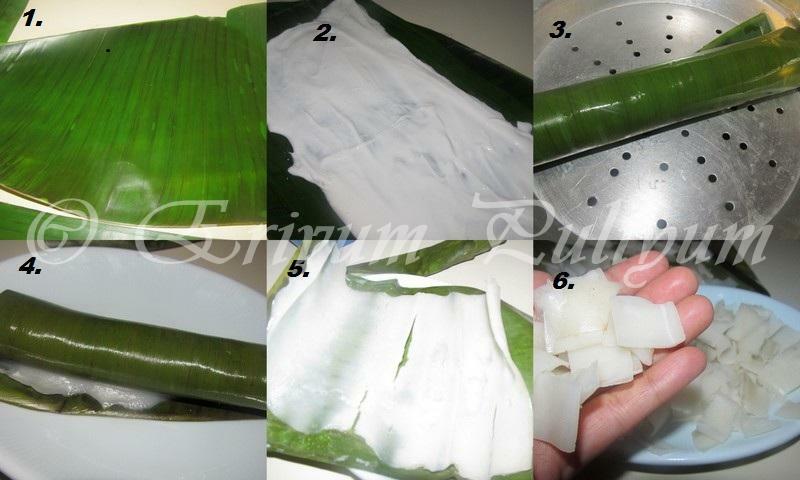 * I haven't tried it with aluminium foil in place of banana leaf although I have prepared ela ada in foil. Hey Julie, super useful post. Wanted to make this for onam but did not get the banana leaf and ended making parippu payasam. Have tried using the aluminum foil for making the ada? I know you used it for making the ela ada (found it when I googled). very lovely julie ... mark as favourite. Full marks for the effort. Sometimes it is simpler buying ready-made stuff but the satisfaction is something else altogether. Oo my..i have seen Ammamma making ada from scratch, Amma or me never dared to try it:-) We rely on the Milma ada:-) Great job Julie! Very new to me, like your step by step presentation dear. Awesome! Wat a useful post, actually we dont get ada here, seriously whenever i saw ada pradhaman i want to try them,thanks for sharing this homemade ada. you have posted a very useful dish didn't have idea on how to make it at home, i used to buy readymade packet. 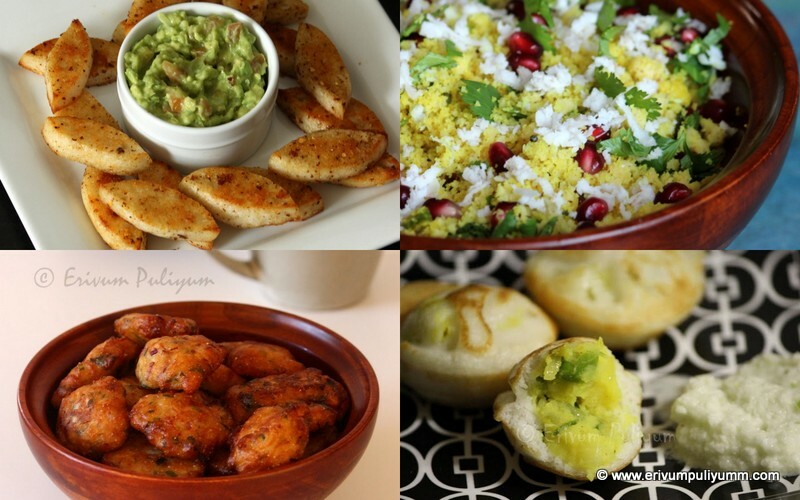 home made adas look awesome..i always use store bought ones..thanks for sharing the method..
Hey thanks for this post. I love ada pradhaman and I always buy the readymade stuff from the store. Wow superb..very good to follow step by step dear! I was looking for it as it wont be available in the US nearby grocers stores.Its very helpful dear.Sure will make it before the weekend arrives!! :) Thank u so much dear.Hats off to you and your hard work!!!! This is something lovely.Never knew about this. bookmarked! 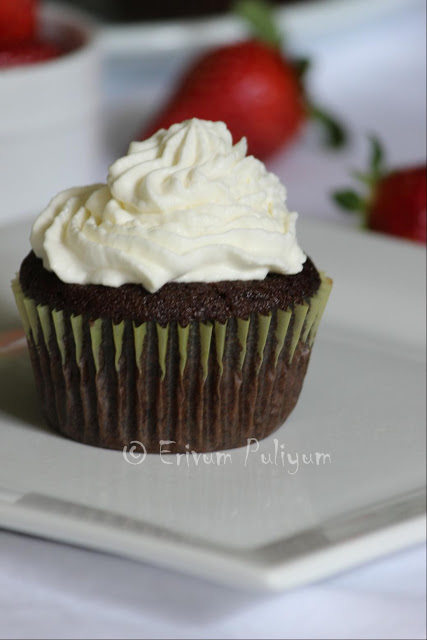 Thank you for posting this recipe ! I did have a question. You had mentioned that if we use the first method, we can store in air tight bags for days. Can we store them in zip lock bags and do we store them in the refrigerator? or outside? Liz,its better to store in air tight bags in refrigerator,I did that way;works good(Thaw before preparing).Though keeping outside may also work good,unless you are sure there is no moisture left in the prepared ada and storage bags. If we do not Found banana leaves what would be next option to madmake ada. Please suggest how to prepare ada if banana leaves unavailable. Jessy: Banana leaves are the only option to make ada. However, you can try making it on an aluminium foil paper( am not very sure of the outcome but feel shud work as I have tried making ela ada in foil paper). Please make a very small batch so that you don't end up wasting.Hope that helps !